he'd developed a physique that would have been the envy of most athletes — but instead of cashing in as a sports star, he decided to join a growing trend and become a crime-fighting mystery man. He adapted his nickname, "Atom Al", into a superhero monicker, calling himself "The Atom". 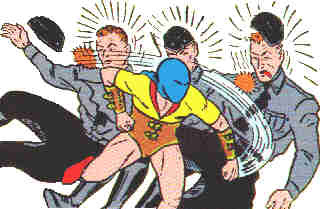 The Atom debuted in DC's All-American Comics #19 (November, 1940), just three issues after Green Lantern. He appeared in most issues until 1945, when he lost his berth to a period piece called The Black Pirate, which had transferred over from Sensation Comics. But then, the atomic bomb was dropped on Hiroshima, and the word "atom" was on everyone's lips. Within months, he received a regular berth in Flash Comics. He missed an issue here and there, but continued to appear until that title's demise in 1949. At no time, however, was he featured on the cover of either All-American or Flash. The Atom was a charter member of The Justice Society of America, and appeared in all but two of the JSA's adventures (one of which coincided with the short time he spent in limbo, between his stints in All-American and Flash). When the JSA was revived, in 1963, he was with them, making occasional appearances in various DC comics. Like most JSA members, he continues to do so today. By that time, like his JSA compatriots, The Flash, Green Lantern and Hawkman, he had a namesake among the new generation of superheroes. But in his case, the revival was in name only — the new Atom bore absolutely no resemblance to his earlier counterpart, except in being a little guy who packed a heavy punch.